Henry M. Whitney : Surf riding at Lahaina, 1875. They possess the general attractive characteristics of the tropical Polynesian groups — that perfection of climate and most charming sceneiy which suggest to the sea-worn traveler Paradise and the Grarden of Eden. of a steamer gliding rapidly along their shores, no scenery can be more picturesque — their mountain tops enveloped in clouds, or perhaps in winter, wrapped in a mantle of snow ; mountain slopes broken into enormous gulches, fern-clad, tree-clad, green with the richest summer foliage, and sparkling with numerous shining waterfalls and streamlets — they present the most delightful picture imaginable. Approaching nearer to the land, plantations of golden sugar-cane attract attention at one station ; broad fields of velvety pastureland, dotted with cattle, transform the solitariness of another into active life ; while groups of cocoanut palms skirt the white coral shores, under whose shade may be discovered, with a glass, the primitive dwellings of the simple natives, themselves strolling on the beach, fishing in the sea, or sporting in the surf. 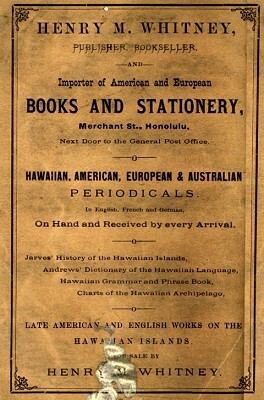 Ten hours' steaming from Honolulu brings us to Lahaina, the islands of Molokai and Lanai having been passed during the night. This town is the capital of Maui, and residence of the governor of the island and other executive officers. 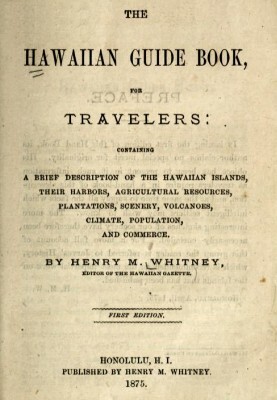 It is built in a grove of cocoanut, breadfruit, mango, tamarind, orange and other trees, which grow to the very ocean verge, whose rocky shore and sandy beach are ever fringed by the foam of the playful breakers that often rise into lofty rollers, the terror of any landing boat, but glorious playthings of the daring surf riders, many of whom live here and are frequently seen sporting in the breakers. Geoff Cater (2013) : Henry M. Whitney : Surf Riding at Lahaina, 1865.